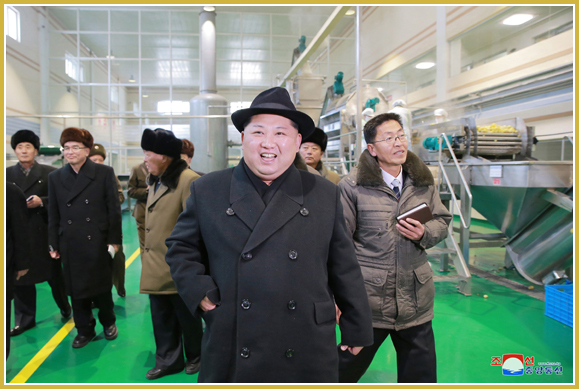 Kim Jong Un, Chairman of the Workers' Party of Korea, Chairman of the State Affairs Commission of the DPRK and Supreme Commander of the Korean People's Army, gave field guidance to the newly-built Samjiyon Potato Farina Factory. He was briefed on the factory before a map showing its bird's-eye view. The factory, with a total floor space of 27 920 square metres and a yearly production capacity of 4 000 tons, consists of a potato farina production building, processed potato production building, 20 000 ton-level potato storage, auxiliary building and workers' hostel. Going round an integrated control room, potato farina workshop, showroom, cultural and welfare establishments, sci-tech learning space, potato storage and other parts of the factory, Supreme LeaderKim Jong Un acquainted himself in detail with its construction and production. He said that more equipment and facilities of various kinds for production of processed potato should be installed additionally to turn out in larger quantities such processed potato products as nutritive rice, slice fry, twist, noodle and udong as well as farina and thus make them known to the whole country as special products of Samjiyon County. He set forth tasks for the management and operation of the factory, urging it to fully play its role as a factory giving substantial benefit to the people by putting its production on a normal track and turning out much more processed potato products. 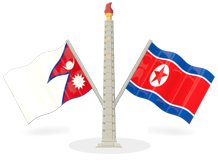 Saying that visitors to the revolutionary battlefields in Ryanggang and other people would be glad to see processed potato products being turned out at the factory, he highly appreciated the feats of builders, scientists and technicians who contributed to building the factory wonderfully. It is a rare and nice factory flawless in all aspects and a model factory in our country's potato processing industry, he said, adding that it would have been better to build this modern farina factory before long ago and show it to Chairman Kim Jong Il. He expressed expectation and belief that the officials and employees of the factory would fully discharge their honourable duty, and had a photo session with them. Accompanying him were Choe Ryong Hae, member of the Presidium of the Political Bureau of the WPK Central Committee, vice-chairman of the State Affairs Commission of the DPRK and vice-chairman of the WPK Central Committee, Kim Yong Su, department director of the WPK Central Committee, and Jo Yong Won, deputy-department director of the WPK Central Committee, and Kim Ung Chol and Ma Won Chun, directors of the State Affairs Commission.